Since performing an inventory count requires your to stop all inventory transactions for the products you are counting, it can be difficult to find time to count all of your inventory at one time. Fortunately, Acctivate allows you the ability to count select groups of items by using Count Cycles. You can assign a product to be included in a particular Count Cycle. 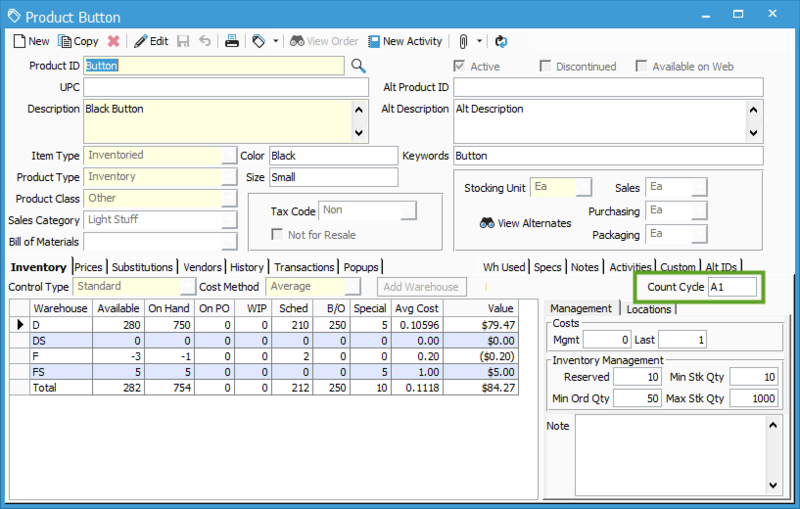 In the product information window you will find text box called “Count Cycle” on the inventory management tab. Here you can enter in an arbitrary value such as a number, letter or combination of the two. Multiple items that are assigned the same value will be included in the same Count Cycle. 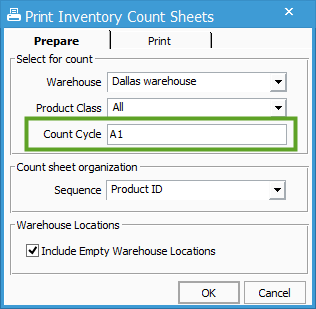 When you are ready to count your inventory, go to Inventory> Print Count Sheets. Here, you will type in the Count Cycle that you want to count. The count sheet will only include items that are in this count cycle. Using count cycles allows you to be more flexible in regards to which items you will count and when you will count them.